The Bowsers combines function & superior comfort in this bed. A streamlined shape define this latest bolster design. Dual layer, fiber topped foam cushion provides orthopedic support and plush comfort. 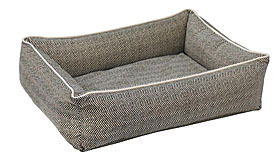 In this unique one piece design, the bottom cushion is secured (zippered) into the bottom of the bed, making this a great solution for dogs that tend to dig and pull out removable cushions. Featuring Bowsers newest linen, faux- leather and corduroy, plus their signature microvelvet fabrics. NOTE: Herringbone, Durango & Cream Teddy are iout of stock until after January 7th.